Organic Down Comforters at Earthsake. A responsible, healthy and luxurious Goose Down Collection made in Brooklyn, NY. The 650 fill-power Hungarian White Goose Down is guaranteed hypoallergenic and RDS certified (no foul play!) All fibers are Oeko-Tex certified, and the outer 305 thread-count shell combines GOTS certified organic cotton with silky TENCEL® Lyocell for maximum comfort and breathability. The organic outer shell is designed to be “down-proof” with a high thread count, which also deters dust mites. The RDS certified down is premium white goose down among the finest in the world. 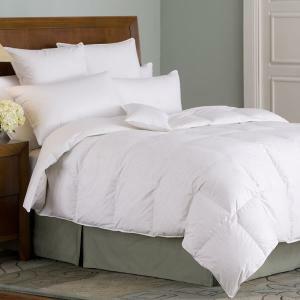 That makes this comforter the most pure and luxurious organic down comforter ever! All comforters use the exclusive “OxyD” double-wash/quadruple-rinse process that makes the down 100% hypoallergenic. Down is naturally sustainable and renewable. These magnificent comforters give pleasure and comfort lasting long into the future. Click here to Check out our Organa RDS Certified Down Pillows - made exactly the same way! 650 Fill Power Hungarian White Goose Down is guaranteed hypoallergenic and RDS certified (no foul play!). Certified to the new Downright RDS (no foul play) standard. Click here to Check out our RDS Certified Organic Down Pillows - made exactly the same way! Pillows and comforters should always be used inside a cover. Pillows should always have on a protector in addition to a cover. Comforters may be spot cleaned for spills and aired out occasionally. While frequent washing is not advised, down products may either be washed on gentle or dry-cleaned. Dry cleaning should only be performed by a company experienced with down products, as dirty cleaning fluid will cause the Down to clump, lose its lofting ability and occasionally develop a mild odor. We recommend washing only in a front-loading commercial capacity washer. No machines with agitators as these are too rough and will tear the baffles, which would void the warranty. Use a low sudsing detergent or a product specifically designed for washing down products. Run through the rinse cycle twice to remove all soap. Place in large capacity dryer on lowest heat setting and dry for several hours. This step is very important, because if down is not thoroughly dried, it may develop mold and odors. Down is a natural choice in more ways than one. Firstly, down is nature’s premiere fill and insulator; And, because down is so lightweight, it’s one of the most comfortable and most desired fills for a pillow, blanket, or comforter. Down clusters look like little cotton balls with a round center called a plumule. Each plumule has thousands of tiny fibers emanating from its core. As these fibers link to others, they create air pockets, which keep you insulated by trapping the heat. The outer shell combines GOTS certified organic cotton with silky TENCEL® Lyocell for maximum comfort and breathability. The outer shell is designed to be “down-proof” with a high thread count, which also deters dust mites. Made in the USA - (Brooklyn, NY). Shipping is calculated online. Our preferred service is UPS. Please allow 7-10 business days (excludes weekends and holidays) for delivery. UPS ground service is our primary service. 2nd day and Overnight service is available at additional cost within the US. (large, oversize and special order items are excluded). Cost for rush shipments will vary based on dimensional weight and type of service. Shipping charges can be accessed on the Earthsake "your shopping cart" page. Zip code must be entered. If no charges appear, please email or call for special rate. Please note that bedding, mattresses, boxsprings & foundations are non-refundable. Ask about our comfort exchange guarantee. Returns for all other items will be accepted within 30 days of the invoice date (items are invoiced as of the shipping date). Return merchandise must be in new, saleable condition and include the original packaging. Returns may incur a restock fee of up to 25%.